ID.Conference is a new conference experience! Allround support for event organizers. 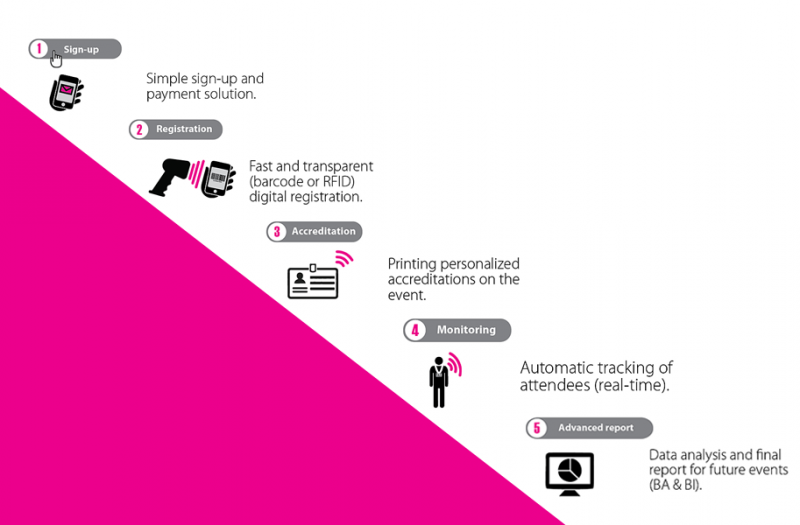 From check-in forms to real time attendee tracking and final event reports. ID.Conference is a complete solution for organizers of conferences, allowing them to monitor data. It consists of a web-based platform, products and services. A key element is an innovative UHF RFID station, which detects participants accreditation at a distance of up to 3 meters. This allows us to track the participants location, their movements in the conference hall and whether a participant has permission to enter. Solution makes managing of participants easier, it gives a better user experience, reduces jams and eliminates long queues. It also reduces the amount of staff needed at conducting this kind of conferences. Participant register itself prior to the event. Cloud system stores data information of participant. At the event participant quickly receives accreditation, as the data of a participant is already stored in the cloud. UHF module placed at the entrance detects accreditation. Green means free passage, while red means that the transition refused. Transitions are now liquid. Data is stored in the cloud. After the event, the organizer receives a final report, which includes data of participant interaction with the event. The report is "feedback" of your event, that gives you information and help in organizing your next event. ID.Conference is the perfect solution for quick registration and analysis of the event. The service allows you to save on staff, collect data on participants in real time, analyze the success of your event and offer tailored / customized "feedback" to the individual lecturer. The transition to digital will not only streamline your organizational process, but also brought the advantage of capturing data, which are an important part of the experience. Big data is and will be the future. Read the interview with CMO of ID.Conference Jasna Triller for the Polish company Stoisko.